Ber Months is coming! — As we start our countdown for the holidays, we’re reminding you of the tax forms that you need to comply this September of 2018 using our tax software. With JuanTax, you don’t have to download and install other tax applications. All you need to do is generate, enter transactions, file those tax forms and that’s it! JuanTax lets you easily do your taxes right without the need for manual calculations. 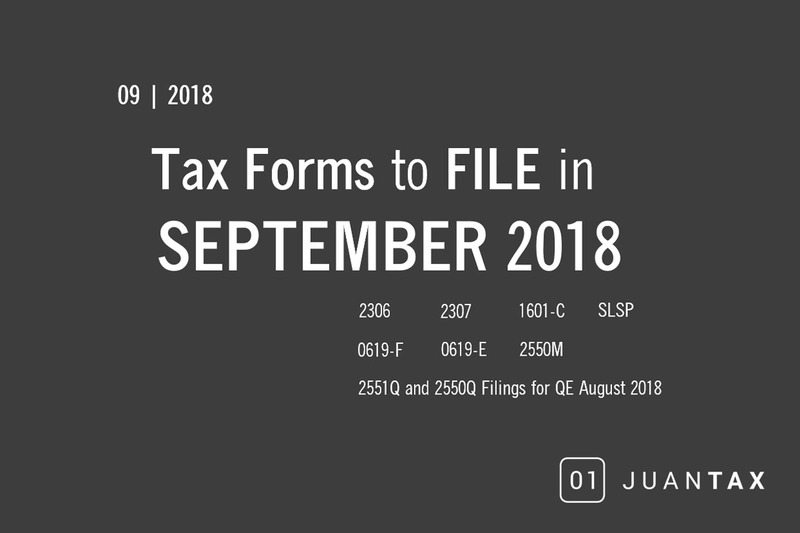 Listed below are tax forms that you need to file in September 2018. Tax forms such as 0619-E (Monthly Remittance Form for Creditable Income Taxes WIthheld (Expanded) and 0619-F (Monthly Remittance Form for Final Income Taxes Withheld) are used in paying withholding taxes for both expanded (0619-E) and final (0619-F) WT purposes. Visit these articles for you to learn more on how to generate reports for 0619-F, as well as 0619-E for both Standalone and Xero integrated versions of JuanTax. 1601-C or Monthly Remittance Return of Income Taxes Withheld on Compensation needs to be filed by a withholding agent who deducts and withhold taxes on compensation paid to employees. Tax certificates such as 2306 (Certificate of Final Income Tax Withheld) and 2307(Certificate of Creditable Tax Withheld at Source) are needed to be complied by a withholding agent to a recipient whose income is subject either from final withholding (2306) or expanded withholding tax (2307). Check out this article to learn more on how to create tax certificates using JuanTax. For VAT filers, you would need to comply with monthly tax forms such as 2550M (Monthly Value-Added Tax Declaration). Value-Added Tax, or simply known as VAT is a form of sales tax which is imposed on sales in goods and services intended to be consumed in the Philippines. Serving as a form of indirect tax, VAT are passed on to the buyer. DAT files such as SLSP (Summary Lists of Sales and Purchases), which serves as a reference attachment along with the taxpayer’s VAT return (to be submitted quarterly). For businesses that follows fiscal year as their financial year, please be reminded that quarterly tax filings are intended for quarter end of August 2018, and depends on your designated fiscal period. Need to file tax forms such as 1601-C, 0619-E, 0619-F and 2550M? Let our tax software help you in doing your taxes right — minus the unwanted hassle of manual data entry.